Implementing interventions in communities and organizations and with individuals requires an understanding of the complexities involved with making any major change. A good idea and evidence that an intervention has been effective elsewhere do not automatically lead to the widespread adoption and use of an intervention. Studying the implementation of interventions has increased our understanding of how to monitor more effectively what happens during implementation to promote success. In this brief, we introduce several constructs that can be used to describe, monitor, and facilitate implementation. Then we describe how to apply these constructs in several ways, including data collection to monitor progress and developing an implementation monitoring plan. We also address how much time each phase of implementation is expected to take. The brief concludes with implications for policy and for supporting practice. Scholars who study change have identified and categorizedimplementation milestones common to most interventions.These can be used to improve the likelihood of achievingfull implementation of interventions. 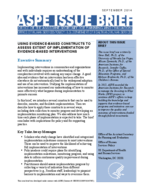 Policymakers could require plans for identifyingimplementation milestones, monitoring progress, and usingdata to inform continuous quality improvement duringimplementation. Practitioners should assess implementation progress bycollecting a variety of indicators from differentperspectives (e.g., frontline staff, leadership) to pinpointbarriers to implementation and ways to overcome them. Policymakers evaluating intervention implementation should be realistic about what can be done within certain time frames, but they should also encourage grantees to move thoughtfully and quickly through the first phase, which is often overlooked.